We handled publicity for the UK, Ireland and North America digital release of British urban crime thriller Anti-Social: Special Edition starring Meghan Markle, Gregg Sulkin and British Grime Artist Skepta, with original music by Drew McConnell and Adam Faulkner (Babyshambles), Itch (The King Blues), and Shara Nelson (Massive Attack). 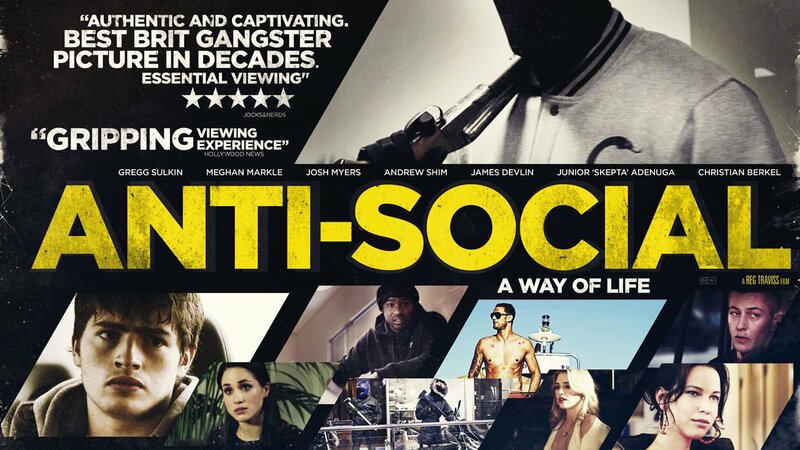 Anti-Social: Special Edition is a feature film inspired by three highly publicized real-life crimes; the Graff’s Diamond robbery in 2009, the Selfridges Burka robbery in 2013, and the Brent-Cross smash and grab robbery in 2012. Central London: As graffiti-artist Dee (Gregg Sulkinn) and fashion-model Kirsten (Meghan Markle) embark on a whirlwind romance, his brother, Smash-and-Grab diamond thief Marcus (Josh Myers), rides high as an underworld ‘face’ on a wave of dare-devil armed-robberies. But while Dee finds a new way of life with Kirsten away from the grit of the street, Marcus makes a move into the lucrative London drugs-rackets and ignites a gangland war resulting in multiple murder and ultra-violence. Ruthlessly hunted by rival criminal Leon (Skepta), Marcus turns to his underworld mentor for help and is offered the biggest score of his life – a high risk West End heist that will bring Dee and Kirsten’s world crashing down. We looked after all aspects of the publicity and digital marketing campaign in the UK and North America. UK & Ireland publicity highlights include front page stories in The Sun and London Evening Standard and prominent coverage secured with The Guardian, BBC, Daily Telegraph, MailOnline, Daily Express, Daily Star, Daily Mirror, The Independent, Radio Times, InStyle UK, Glamour Magazine UK, E! News UK, Hello Magazine, Digital Spy, OK Magazine, International Business Times UK, MSN UK, AOL UK, Irish Examiner, Independent.ie, Irish Mirror, Town and Country Magazine, The Scottish Sun, The Northern Echo, Capital Radio, trailer syndication to all key YouTube channels, and more. North American publicity highlights include Vanity Fair, Harper’s Bazaar, TIME Magazine, People Magazine, Entertainment Tonight, E! News, Bustle, InStyle, JustJared, Yahoo, The Stir, Hello USA, MSN, Entertainment Weekly, ComingSoon.net, International Business Times, New York Daily News and several local print, online and radio hits across the country.